Traffic Statistics reports provide metrics intended to let you perform a background analysis of the messaging activity, mostly in graphical format. Generate clearly understandable graphs showing the distribution of messages by size, hour, or day of the week to analyze user behavior, or to plan for maintenance work on Exchange servers. Billing reports let you invoice internal Departments or branches based on the volume of email they send or receive, the size of their mailboxes, or both. 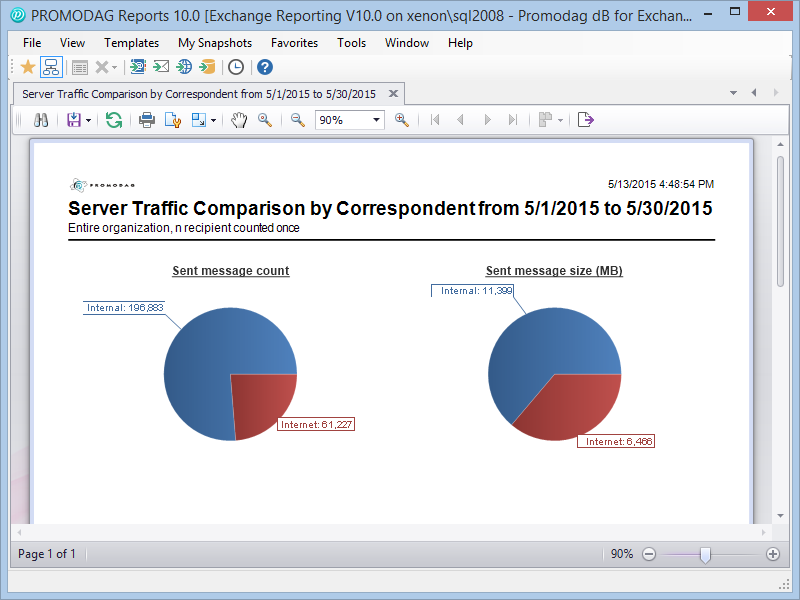 Connector flow reports are useful measurement tools that display the volume of emails that flow through the Exchange servers of the organization. 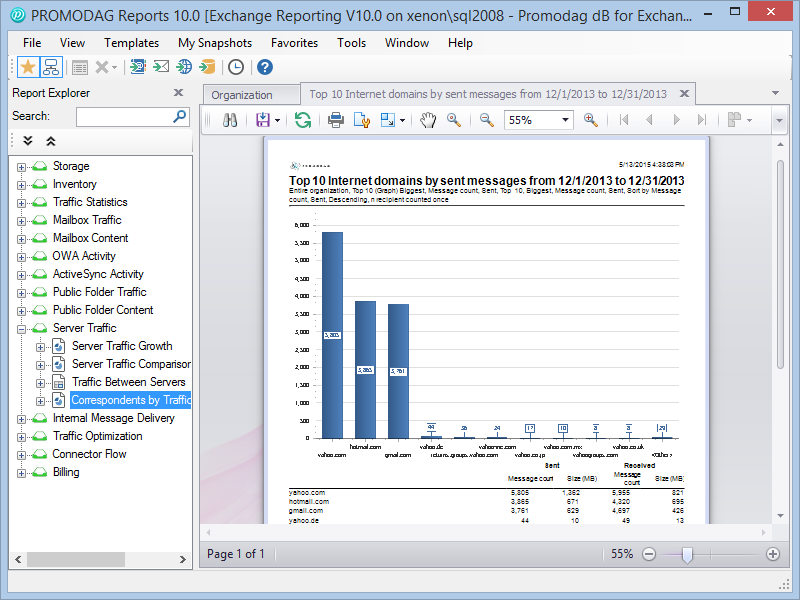 These reports deal with incoming and outgoing messages, unlike traffic reports that are about sent and received emails. Please note that connector flow events are not imported by default. 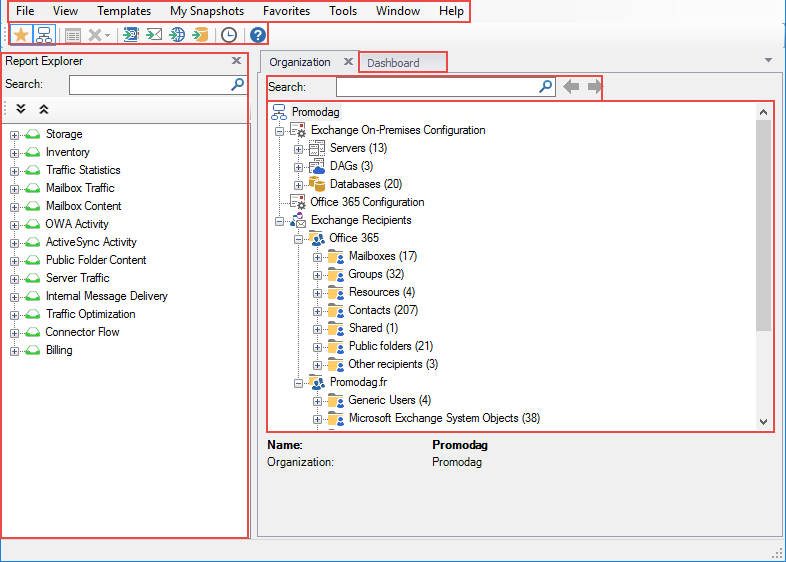 Run traffic optimization reports to estimate the usage of old SMTP addresses or to list NDRs. Use Internal message delivery reports to measure the real quality of service being delivered to end-users. Knowing who does what is essential to the security of your messaging system, especially since it has become accessible from the Web. ActiveSync and OWA reports help you measure the activity of users down to the hour and IP address used. Use the full power of content reports to filter on individual Outlook items based on specific properties in a group of mailboxes or public folders. Estimate the weight of old items in mailboxes, as well as the number of messages in the Deleted items folder. Measure response times to messages stored in the Customer Services or Sales Rep inbox to optimize your business relationship. Use traffic reports to list messages sent from, or delivered into mailboxes or public folders. Search for specific messages by subject or number of recipients using advanced filtering functionalities. Determine trends in traffic evolution and isolate the top n senders or receivers in the Exchange organization, or simply within a group of mailboxes. Inventory reports have been designed to lists Exchange-related objects, that is servers and the different types of recipients they host, along with their attributes. Should the administrator need to quickly get a complete listing of all users with their email address and phone number, or details on the mobile devices used by the Sales Department, this is the place. Use storage reports to bring the top 10 largest mailboxes to light, or to list quotas for entire groups of mailboxes. Check the evolution of mailbox size in time to highlight trends and plan for archiving unnecessary emails. 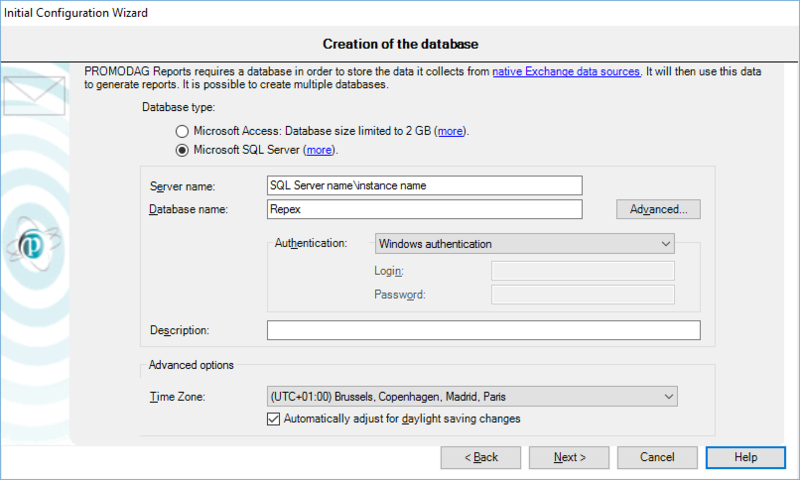 Monitor the changes in size of Exchange database files and transaction logs over time to detect potential anomalies. If you'd like to have a chat with us about Promodag Reports, please select this option. If you'd prefer to email or phone us, our details are also here.